Most iPhone users probably use their phone more often to text than to make calls with. And thanks to Apple iTunes, they can back up text messages on computer to prevent accidental data loss. However, what if you delete or clear out messages from iPhone by mistake? Actually, these messages are not deleted completely if you have backed up before. You can get them back from your iPhone backup. When restoring from iPhone backup, it would recover all sorts of iPhone data, which means that all your current data on your iPhone will be overwritten and replaced by the previous data in the backup, including photos, contacts, notes, reminder, calendar, etc. So may iPhone users are eager to know how to recover just text messages from iPhone backup. 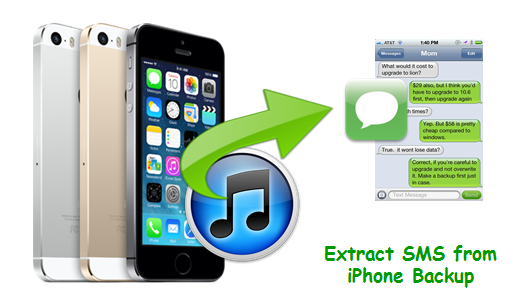 Yes, there is an iPhone Backup SMS Extractor tool which could help to browse and extract messages from iTunes backup – iPhone Backup Extractor Freeware. By using this tool you can easily access to iTunes backup and export messages including texts, SMS, MMS, iMessages to your computer in readable format for better reviewing. – Extract not only iPhone text messages, but also contacts, call history, photos, videos, notes, WhatsApp, and more from iTunes backup files. – Work with iTunes backup created for iPhone SE, iPhone 6S, iPhone 6S Plus, iPhone 6, iPhone 6 Plus, iPhone 5S, iPhone 5, iPhone 4S, iPhone 4, as well as iPad Pro, iPad mini 4/3, iPad Air 3/2 and iPod touch 6/5. – Preview SMS messages and other scanned contents in detail and selectively recover what you exactly need. – Risk-free and read-only application, extract text messages from iPhone backup without any damage to your data or computer. 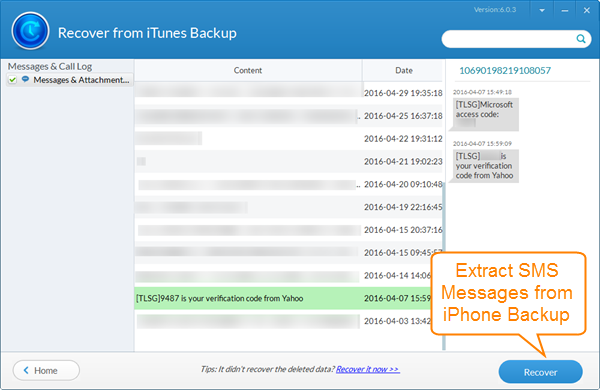 1.Select Backup File: Select the iTunes backup file you need to extract text messages from and click “Next”. 2.Specify File Types: Select the Messages and Message Attachment that you want to extract from your iPhone backup and click “Next”. 3.Extract Messages: Preview and check the scanned messages in detail, then click “Recover” to extract text messages from iPhone backup. * Please make clear that the Free iPhone Backup Extractor will restore your SMS messages to your computer, not to your iPhone. If you want to restore the text messages from iTunes to your iPhone, turn to Phone Transfer software. This program helps to transfer contacts, SMS, photos, videos, music from iTunes to iPhone or even Android phone directly. Also, it acts as great iPhone data backup tool to transfer text messages from iPhone to computer to prevent accidental data loss. * If you don’t have any available iPhone backup, don’t worry, just connect your iPhone to the computer and use iPhone Data Recovery to directly scan the device and recover deleted messages.